At what point in a project do you decide to frog? Usually I have no qualms about frogging something and starting again if it’s not right. However, I’m currently in the midst of a project where I have a nagging feeling that perhaps I should completely frog, but I can’t quite bring myself to take the needles out and spend some quality time with my ball winder. The pattern is Pickadilly. Since starting it in July last year, I’ve had issues the yoke, the waist shaping and the sleeves. It’s such a shame because I was so excited to start on this project, thinking that I’d found the perfect pattern to go with the Grignasco Tango I had in my stash. I still think the cardigan looks great in the smokey blue tweed. After re-knitting the waist, I think I’ve got it pretty spot on for my body. However, I’m now onto the sleeves and thinking about frogging the lot and trying it again sometime in the future. A few people on Ravelry have mentioned that they have needed to modify the sleeves and I’m no exception. I’m now on my third attempt at the sleeves and even with heaps of decreases, there seems to be too much fabric around the underarms and the sleeves seem too baggy. To me that suggests that there’s issues at the yoke which means a lot of frogging, but it may also just be a side effect of knitting a raglan from the top down. It pains me to think it might be best to cut my losses and frog the lot. It’s almost a point of pride that I’ll finish a project no matter how long it takes; Matt’s suave sweater is testament to that. But this feels different. As much as I like the idea of the cardigan, I’ve really struggled with sections of the pattern and I’m frustrated with it. I really must apologise for the tone my posts have been taking of late. While I’m not a particularly cheery person in real life, I try not to be too negative here. Thank you for bearing with me while I vent my spleen a little, I promise you slightly sunnier posts are on their way! Oh vent away! We all need to. Sometimes I think a lot of pain going into a project makes it so much more meaningful when it’s done. And sometimes I don’t. The trick is figuring out which one of those is going on here. I wonder if your problem is just that it’s taking so damn long. A lot of pain over a relatively short time can be worth it but when you’re not seeing results you’re happy with and it’s taking forever, well maybe it is time. I have some tango I’m yet to find the right project for too. Well on the other hand, if you figure out the first sleeve, then the second sleeve will be easy peasy! But I do hear you on the temptation to rip. I recently ripped an entire finished cardigan, because I was so unhappy with it. And I don’t regret it one little bit. The resulting replacement cardi with the same yarn will be so much nicer, should I ever finish it. As for your posts, I hadn’t noticed a negative tone in them at all! It may be that I’m a bit stupid though, and didn’t notice. But it’s your blog – you write what you want to write! You know I’ll read regardless! I concur with Michelle – your blog so you write when and what you like! As for frogging – I do it quite often and rarely regret it. But I do procrastinate and agonise a fair bit before ripping into it! top down raglans arent as easy as people think, because the increasing for the bust doesnt always equal the size you need for the sleeves, which looks like what happened here. i think if your instinct is to frog i would, and its ok to realise that a certain project and yarn arent meant for each other. 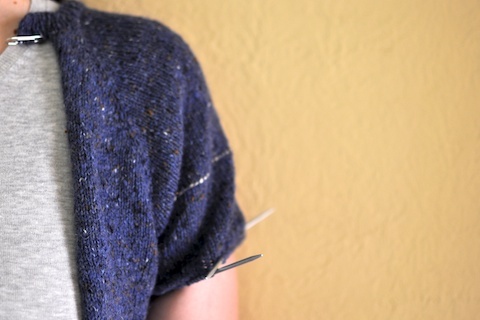 tango is a tricky yarn, it looks great as a tangled yoke cardi tho. or maybe a coraline? also, i dont need sunny posts! life isnt always sunny, and the tough bits balance out the good, they’re all as important as each other. i hate it when bloggers only write about good stuff, it makes life seem so unrealistic! There’s a difference between taking a long time to finish something you are happy with and continuing to work on a project that you have reservations about. Have you frogged or are you persevering?